In January, the Honda Fit outsold the Prius in Japan. Prius had been the number one selling car in Japan for 20 months. Half of the Fits sold were the new Fit Hybrid, which delivers 71 miles per gallon (MPG) using the Japanese JC08 test cycle. In 2012, both the Fit Hybrid and new Fit EV are expected to start selling in the U.S. The Honda Fit has been a popular small hatchback, with over 3.5 million sold globally. With five doors, seating for five, and flexible cargo space it is big enough for most, yet small enough to fit in those precious city parking spaces. Drivers like the sport fill and handling. Starting at around $15,000, the Honda Fit delivers 31 mpg, the mileage of many hybrids. The Fit Hybrid removes pain at the pump with the 71 mpg in the Japanese test cycle which emphasises slow city driving at 16 mpg; by comparison the Prius is 77 mpg. Power is delivered from the IMA electric motor and from an efficient 1.3-liter i-VTEC engine. The battery for the hybrid system is located under the rear cargo and enables the Fit to share the same flexible seating configurations as the rest of the lineup without sacrificing interior comfort that is unique to Fit. The Fit offers more room than outward appearances suggest. It has a B-segment exterior, but a larger C-segment interior. In the back is 20.6 cubic feet of cargo, but drop the back seat and you have 50.7 cubic feet. If that still is not enough for your ladder, home project, or surfboard, then you can flatten the front seat for added feet. In Japan, the passenger seat can even rotate for easy in-and-out or socializing with others. If you’ve been looking for great mileage from an SUV, crossover, or wagon, take a look at the new Prius v. It will share the current generation Prius’ platform and Hybrid Synergy Drive technology. Featuring a compact exterior yet spacious interior, the Prius v will feature over 50-percent more interior cargo space than the current Prius, while being almost as aerodynamic. The Prius v will compete with new crossover hybrids like the Ford C-MAX Hybrid. The Prius v will use NiMH batteries, just as the 2011 Prius. Next year, Ford will start delivering lithium batteries in all hybrids and electric cars. Honda has countered by unveiling a longer Honda Fit Shuttle available with the current efficient ICE drive system and the new hybrid drive system. 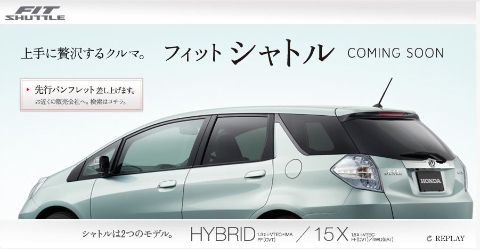 This compact wagon can be examined on Honda’s new Fit Shuttle Japanese website. The wagon is expected to be unveiled at the Geneva Auto Show next month. Unfortunately, Honda is unlikely to offer this larger Fit in the U.S., at least for now. Honda unveiled the all-new Fit EV Concept electric vehicle at the LA Auto Show in November. In 2011 the Fit EV will be in fleet trials at at Google, Stanford University, and possibly others. In 2012, the car will no longer be a concept as customers go to dealers and buy the Fit EV. The Fit EV will compete with the larger Nissan LEAF, the Ford Focus Electric, and the Toyota FT-EV. The Fit EV will achieve an estimated 100-mile driving range per charge using the US EPA LA4* city cycle (70 miles when applying EPA’s adjustment factor). Driving range can be maximized by use of an innovative 3-mode electric drive system, adapted from the 2011 Honda CR-Z sport hybrid. The system allows the driver to select between Econ, Normal, and Sport to instantly and seamlessly change the driving experience to maximize efficiency or improve acceleration. While in Econ mode, practical driving range can increase by as much as 17 percent compared to driving in Normal mode, and up to 25 percent compared to driving in Sport mode. Acceleration improves significantly when in Sport mode, generating performance similar to a vehicle equipped with a 2.0-liter gasoline engine. In their battle for hybrid and electric car leadership, both Honda and Toyota are learning a lesson from Ford – price matters and therefore manufacturing cost matters. Ford is offering 10 to 14 new models on a global C-car platform with many chassis and components being common across a range of cars, SUVs, and crossovers. Ford will lower manufacturing costs, use high-volume common parts, and improve efficiency. Ford will increasingly enable customers to select a vehicle, such as the Focus, with powertrain options ranging from efficient engine to hybrid to plug-in hybrid to pure battery electric. C-MAX Energi and C-MAX Hybrid are two of 10 to 14 new models that Ford will launch around the world based on its new global C-car platform – Ford’s first truly global One Ford platform. Ford’s new generation of C-segment vehicles will be sold in more than 120 markets and will account for more than 2 million units annually. The C-segment accounts for one in four cars sold worldwide today and, in conjunction with the B-segment, Ford expects it to rise to 50 percent of all cars sold globally by 2013. Honda is wise to expand its popular Fit into a family that includes a larger wagon, Honda’s best mpg hybrid, and an exciting electric car with the potential to become the EV price leader. In a growing battle for fuel-efficient family offerings with Toyota and Ford there will be one clear winner – the customer. Still not seeing a swappable battery that can be “quick changed” This type of battery pushes solar power to the forefront along with the electric cars and bikes coming to market. Most major auto makers see the battery pack as integral to their drive system and will not be open to someone else’s battery, but their own could be switchable such as upcoming electric cars from Tesla and Cherry will have swappable batteries.